Coastal marsh wetlands, home to water birds and other animals, contain various types of plants adapted to varying water levels and salt concentrations. Brackish water has a higher salt content than fresh water, but is less salty than seawater. Many species of plants are found in tidal saltwater, freshwater and brackish wetland ecosystems. Saw grass (Cladium jamaicense) is a large grass, growing 4 to 10 feet tall. It is the dominant plant of the Florida Everglades, according to University of Florida extension. It is also found throughout the southeastern United States. Saw-grass grows from rhizomes, producing large, hollow-stemmed, stiff leaf blades. Its blades are somewhat three-angled, and flat to v-shaped, with underside midribs covered with small, sharp saw teeth. Its large inflorescence is held high above the foliage, consisting of light red-brown spikelets and tiny nutlets. Wax myrtles (Myrica cerifera) are large evergreen shrubs or small trees, with a clumping, irregular form and medium texture. Its native habitat is coastal plains from Maryland to Texas. Wax myrtles have simple, aromatic, 4-inch, oblong to lance-shaped, olive green, coarsely serrated leaves dotted with small rusty glands on both sides. It produces inconspicuous flowers and very waxy, ¼ inch, grayish-blue fruit in dense clusters during fall, which birds eat during winter. Wax myrtles are cold hardy to USDA zone 7. 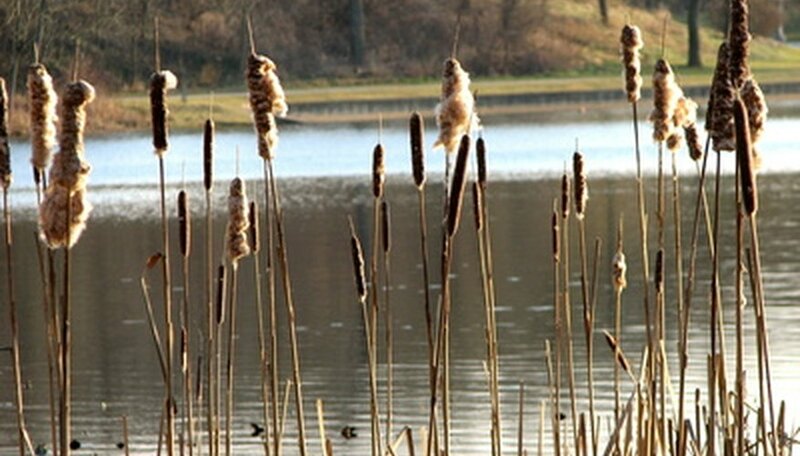 Common cattails (Typha latifolia), herbaceous perennials, grow from rhizomes and reach 5 to 10 feet tall at maturity. Its green, waxy coated leaves grow 5 feet long and 1 inch wide. Cattails produce large flowering spikes borne on tall shoots from spring to early summer. Highly invasive, cattails are cold hardy to USDA zones 3 through 9. Arrowhead (Sagittaria latifolia) plants grow to 24 inches tall and produce large, glossy, arrowhead-shaped leaves, about 6 inch long and pendulous. Its conspicuous summer blooms consist of boat-shaped bracts (modified petals) and clusters of white flowers. Arrowhead plants are cold hardy in USDA zones 4 through 11. Marsh hibiscus (Hibiscus moscheutos) is also known as rose mallow. It is native to the southeastern United States, and grows in wetlands and along creek edges. Marsh hibiscus height varies by cultivar, with some reaching 8 feet tall with 10- to 12-inch wide flowers. Flower colors of marsh hibiscus include red, pink or white. These perennial plants are cold hardy in USDA zones 5 through 9.